But we are made to eat meat! 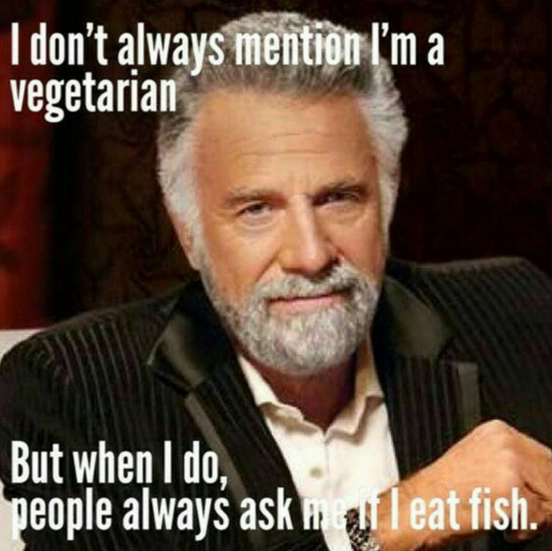 I am vegetarian. In Canada I eat how I like, though eggs I rarely have the chance to eat and dairy I only eat cheese, which I try to minimize. In Ghana, there is less culinary variety, yes, but since becoming vegetarian, I have learned to make variety with few ingredients. The problem is when others feed me and either do not know I am vegetarian (they cook for me before learning) or do but put meat in my bowl anyways. In these cases, I feel forced into flexitarianism, due to the rarity of vegetarianism as compared to in Canada. That being said, do not think I am the only vegetarian in Ghana, with the Vegetarian Association of Ghana, there are definitely others, though they are often far more flexible than I (for example my brother tells me he is vegetarian but still eats fish and chicken!) am willing to be. Also, vegetarian meals do exist in Ghana, just people still add meat when they make or buy those; when I do either, obviously I do not. You can eat fish, though, it’s not meat! Meat is the flesh of an animal, so fish is meat. And do not try telling me fish is not an animal because it is; it is a vertebrate. So you want to prove I am a hypocrite? Let me save you some time, here: I am a hypocrite, in fact humans are by nature hypocrites. We have too many contradictory values and often have to choose the best from less-than-ideal choices. And this includes you! Chances are you are not a fan of the dog meat festival, yet if you are a meat-eater, then you have no problem putting pigs through the same or worse forms of torture? And pigs are more intelligent than dogs! I am healthier than ever and by extension feel better than ever; I have far more variety in my diet (contributing to my being healthier) and it is all tasty, so why not ask me that again! Even in Ghana, where like I said there is less variety, I have too much variety to miss meat …if only others would understand that and stop trying to make me eat meat! And? Have you tried it? Because like meat, tofu is all about the flavours you add AND there are different types. Do you think that is all vegetarians eat? Because it is not. In fact, I rarely eat tofu. I love it, but see no point in spending more money for something that is processed out of soy (which is in everything), when for significantly less, I can buy a bag of dry legumes and eat that. This may be surprising, but preparing lentils takes no time at all and if you prefer beans, you can soak them during the day, then throw them in a pot on the stove in the evening until they are done and they are ready for the next day. All you need to do is check them every once in a while to ensure there is enough water and they have not finished cooking. What would you do if I tricked you into eating meat? What kind of human are you? Why would you do that? I am not a child, who has never tasted it and is saying it is yucky, I am adult who made a conscious decision to eat the right things. Instead of tricking me, try learning about my diet instead. Also, this was only said to me by someone who asked me this right after feeding me! I knew they had not tricked me because they had made a sauce with a massive meat ball for each person except me. I was not tricked into eating meat, but I was not given the option to not eat the sauce without the meat juices. This was when I first became vegetarian and did not have a toolbox for dealing with such situations. Even now my toolbox is rather empty, as this regularly happens to me in Ghana, but it is full enough to deal with Canada. Why not just pick out the meat? Am I allowed to eat meat around you? I will show you the same respect you show me, so if I can eat vegetarian around you, then you can eat meat around me. Not much else to say about this one. Wow, you are so good, I could not do it! Could not or would not? There is a difference. This answer depends on the person, but the average vegetarian has not only a healthier diet, but a healthier lifestyle than the average meat-eater. Since that is the case, let me throw the question back at you, as fast food, packaged food and junk food are not going to give you all of YOUR nutrients! Let me help you: a balanced diet consists of ¼ protein base, ¼ whole grain, just over ¼ vegetables and just under ¼ fruit; the more you cook from scratch, the better and no, this does not have to take all that much time. Why? And do not tell me something stupid like animal rights! First, why are animal rights such a bad reason? Second, there is a reason animal rights did not influence my decision to become vegetarian and that I have yet to give this reason to people; those of us considering animals right are shamed by the rest of the population. Maybe you should read my last post to understand why animal rights is NOT a stupid reason. 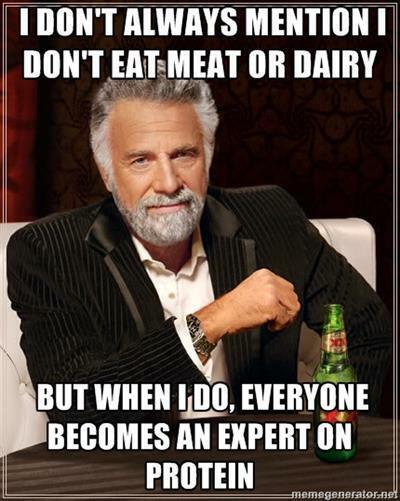 At least you do not shove your opinions down other peoples’s throats, like other vegetarians! I hate when you people start telling us what to eat and not to eat. I cannot think of any vegetarians or vegans I have met like this, but I will give the benefit of the doubt and say that I must have met one or two. Meat-eaters, on the other hand, are constantly trying to shove their meat-eating fallacies down MY throat and trying to convert ME! And finally, on a similar note: at least you are not vegan! Who told you I am not planning on becoming vegan at some point? 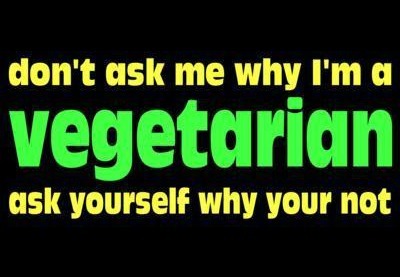 The joys of being a vegetarian! 😀 I also have a whole post dedicated to the “But do you eat fish?” question! Right?! It is amazing how many of us are motivated to write our own posts of these sorts. I searched and more than a few of the ones I listed and also others have posts dedicated to them alone!